In an unprecedented partnership between two professional sports teams, the Arizona Diamondbacks and the Phoenix Suns have joined forces to develop an outdoor marketing and entertainment district in downtown Phoenix called the Legends Entertainment District. The 55,000-square-foot district is located between the US Airways Center and Chase Field, on Jefferson Street between First Avenue and Seventh Street. The $8.6-million project, contributed to in equal parts by both teams, was inspired by L.A. Live, New York’s Times Square, Las Vegas and Tokyo. 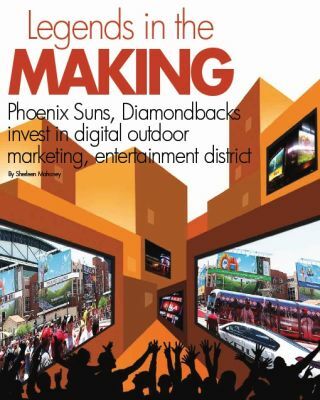 Its goal is to energize downtown Phoenix, attract advertisers and visitors and keep them in the area longer. Advertisers have the opportunity to reach the 5.3 million visitors who flock to the area’s more than 700 events annually, and the city and both teams benefit from the revenue. Area visitors are greeted and entertained by full-motion digital signage and custom large-format super-graphic billboards, including the largest digital sign in the Phoenix Metropolitan area. “We wanted to redecorate downtown Phoenix and create a live experience to infuse some energy into the city,” said Judd Norris, general manager of Legends Entertainment District. Panasonic, and its full-motion digital technology, was selected as the project’s technology provider, and Young Electric Sign Co. (YESCO) beat several competitors by presenting a unique reverse engineering strategy to serve as the signage manufacturer and consultant. Since a project of this size and scale was unprecedented for Phoenix, YESCO assembled an internal team dedicated to conceptual design, construction, engineering and installation. They developed a comprehensive master sign plan that was approved by the city of Phoenix. Finally, Xeriom was selected to provide the infrastructure to connect the district’s network. Currently, there are 26 static opportunities that support super graphics and wallscapes, five custom locations that support 3-D and 4-D graphics, and 13 full-motion high-resolution LED boards that are featured on the façade of the US Airways Center, Chase Field and the Metro light rail station. Two 46-foot-tall freestanding towers with giant LED screens bookend the district. The first is located by Chase Field, and the other is located by US Airways Center. As visitors enter the downtown area for games, shows, concerts or dining, the first digital sign they encounter is a 69x14-foot illuminated vinyl super-graphic display on the Luhrs Building on First Avenue and Jefferson Street. As they head east toward the US Airways Center, they won’t be able to miss the 46-foot freestanding tower that includes three 22x13-foot full-color main video boards and two LED halo rings that broadcast upcoming events in the district. On the US Airways Center’s exterior are two 50x25-feet glass displays that beautifully curve around the venue and two 50x25-foot displays and custom designs that proudly feature Coca-Cola and Fry’s Food Stores advertisements. An array of signage that features Chevy, Fox Sports Arizona and Fry’s appears on the Jefferson Street Garage and Phoenix Convention Center and garage. Further east, on the façade of Chase Field, is a 70x40-foot full-color, full-motion LED board, an 18x37-foot design that features Pepsi marketing and a custom design that features a Verizon ad. In addition to marketing and entertainment events, the digital signage is also used to educate the community. APS, Arizona’s electricity and power company, has signed on as an advertiser to educate their customers about renewable energy and promote energy- and money-saving products and services. Managing all the content, keeping it fresh and ensuring sponsors satisfaction is no easy feat. For example, the US Airways Center partners with Coca-Cola, while Chase Field partners with Pepsi. Norris and his content team must be mindful of ad placement locations and designs. The content system allows the management team to manipulate the content quickly and easily so every time people visit the LED billboards and screens, there’s something new to draw their interest and attention. The entire project uses 2 billion LED lights, 228 miles of fiber-optic cables, 23,000 feet of electrical EMT conduit, 47.3 tons of steel to create static and LED signage, and 140,000 feet of electrical wire. Thousands of people pass through the district every day, but now that the NBA season has finally started, fans are getting a chance to experience the district for the first time. New signs are constantly being added, but for Norris and his team, 2012 will focus on brainstorming new ways to enhance visitors’ experience. They’re striving to stay on the cutting edge of technology to bring the latest and greatest to Legends. According to Norris, the future may bring exciting new ways for people to interact with the technology; for example, they may be able to send messages, tweets and even photos to the billboards. The Legends Entertainment District has elevated Phoenix as a must-visit city for travelers and sports fans.